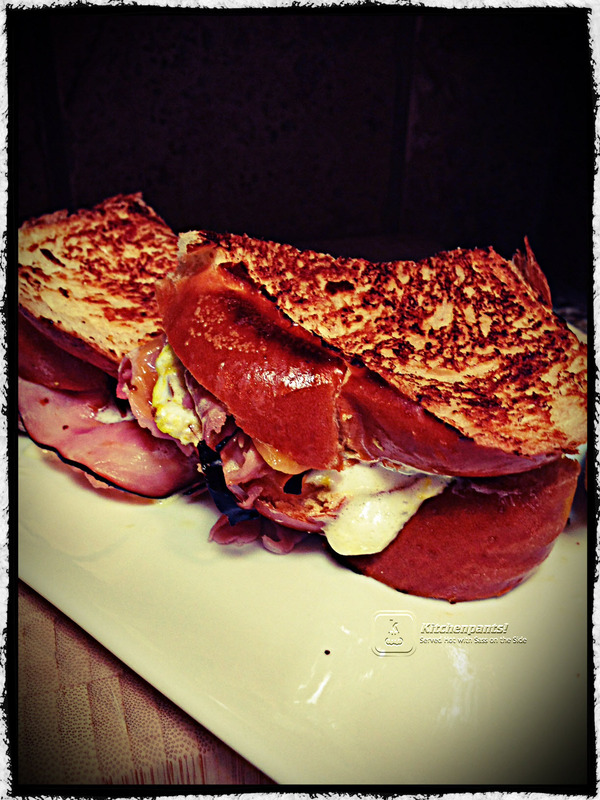 Peeps Grilled Ham and Cheese | Kitchenpants! I have all of the grown-up essentials: career, house, car, kids, and girls’ night out (because when you are a real grown-up, it’s not just “going out” anymore – you have to name it to get away with it). I do all the grown-up things that I knew I would: pay bills, get regular dental check-ups, clean my house (constantly), and all the rest of the never-fun-but-completely-necessary-things that grown-ups do. I assume that you know where this is going…but you are only partly correct. You’ve read the title of this post and you probably think that I am going to tell you that despite being a grown-up, I still have a soft spot for that sugar-coated marshmallow candy of my childhood, the Peep. Uh, no. It’s way beyond that. I am giddy when it comes to Peeps. I absolutely love them. Love. Them. The way to my heart (well, one of them anyway) is via Peeps! There’s a little spring in my step when the Easter displays go up (and Christmas and Valentine’s Day). Simply put, Peeps make me very, very happy. It’s not just me, either. Scope the internet and you will find a ton of Peeps-related recipes…but very few that are more to the savory and less to the sweet. Sorry, kids – anyone can put a Peep on a cupcake. If you like salty and sweet, you will love this recipe! Sharp Cheddar Cheese – You must use sharp. The cheese here needs to stand up to the sweetness of the ham and bread. 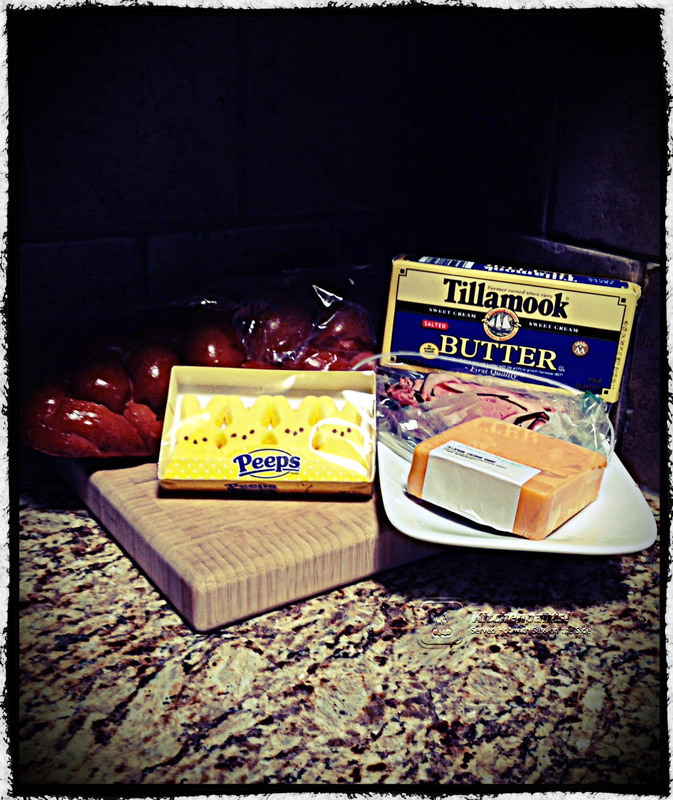 I use Tillamook, but any good sharp will do. Peeps! Peeps! – I used yellow bunny Peeps for this because they are flat. You can use whatever color you like. Warm the skillet a bit on low-medium heat. Drop the ham in the skillet to warm it. (If you want, you can use a cooking spray to keep it from sticking, but it may not be needed depending on the ham you are using.) Warming the meat in a melt sandwich is so key…don’t skip this step. Slice the Challah bread into 1/2 inch slices at least. You can go a little thicker if you want. Slice the cheese (if you haven’t already bought it in slices) into thin slices. Use as much as you like to your taste. Butter the Challah bread on one side each slice. Move the ham over and place the slices of bread on the skillet butter side down. Turn the heat up to medium-high. Place slices of cheese on each slice of bread. Add the Peeps to each slice of bread on top of the cheese. You may use as many as you like to your taste. I smashed three and used two on one side and one of the other, but it is up to you. Finally, layer a bit of the warm ham on each slice of bread. Cook for a minute or so over medium-high heat. When the bread starts to brown, put the sandwich together and keep cooking it until the cheese is melted and the bread is browned to your taste.